Bollywood has a lousy track record with horror films in the past couple of decades. Most makers of spookfests and mind benders in Hindi have, for what seems like the recent forever, tried to manipulate audiences with screeching sounds, sudden camera movements and other clichés. Phobia has no time for such low-brow nonsense. Director Pavan Kirpalani’s third film is a heart-stoppingly frightening thriller that refuses to take the viewer for granted. His first, Ragini MMS in 2011, was flawed but proved that he was cut out for the genre. Phobia is simply brilliant in the way it rolls up to the multiple massive surprises in the end. 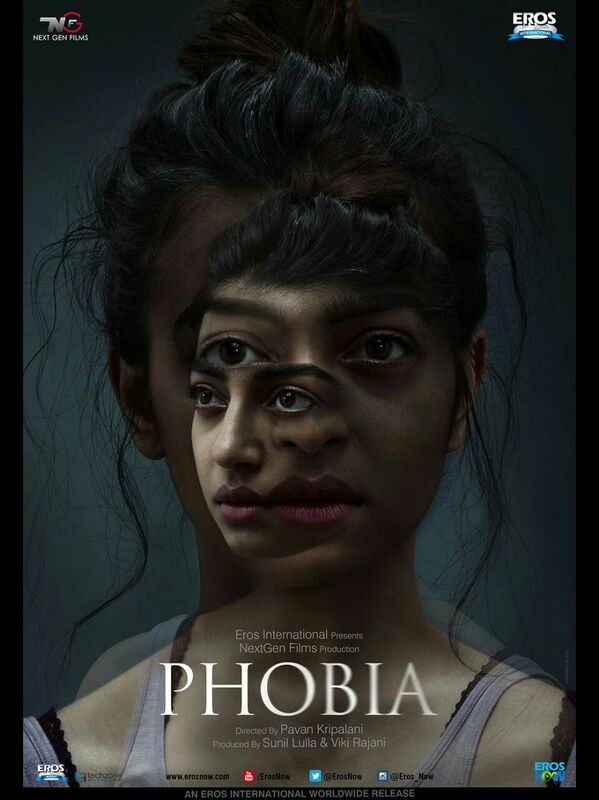 This is seriously scary, seriously intriguing stuff that, as it happens, features a career-defining performance by Radhika Apte. The film begins with wickedly chosen clues. Franz Kafka’s words, “A cage went in search of a bird”, appear on screen before the camera closes in on a painting. Next we meet artist Mehek Deo (Radhika Apte), surrounded by what seem like friends and admirers at her exhibition while she narrates a story about a cat and a weird old man and gently ribs a chap called Shaan (Satyadeep Mishra). Everything in that apparently innocuous scene is crucial to what follows. Soon after, Mehek is sexually assaulted and develops agoraphobia, an anxiety disorder that leads her to fear leaving her home. Shaan, her some-time lover and full-time friend, takes her away from the flat she occupied with her sister with whom she shares a tense relationship, to a friend’s apartment since he is sure solitude will cure her. He does not, however, anticipate the creepy neighbour (Ankur Vikal) and the diary of an ex-tenant who went missing, which start preying on Mehek’s mind. What follows is a hair-raising parade of visions, violence and then gore. Satyen Chaudhry’s design of the rented house is crucial to the panic building up in Mehek’s mind and the anticipation mounting in ours. The air of decaying prosperity, the walls bearing paintings with darkened human figures that could easily be mistaken for mirrors in which we are possibly seeing a reflection of someone watching Mehek from behind – it is all very spooky. Jayakrishna Gummadi’s camera occasionally changes vantage points so that we sometimes watch the proceedings as outsiders and sometimes right beside or behind Mehek, hoping to see what she sees. His work, Vivek Sachidanand’s sound design and Karan Gour’s background score never once make us conscious of how they are working to play around with our heads. Fully backing the talent backing him, the director builds up a sense of foreboding from the very first shot. He occasionally relieves the tension with a genre cliché – a bathtub, a musical timepiece, a peephole, a character opting to enter an eerie place though we as viewers are smart enough to know it probably houses a ghost – possibly to convince us that since this is familiar ground, we are well prepared for what comes next. In one scene, a knife is conveniently left in the vicinity of a patient with a grave psychological ailment. As it turns out, a cliché is not a cliché and a loophole is not a lazy loophole if what you saw is not what you think you saw. There are brief passages of humour in Shaan and Mehek’s fights and when her paranoid actions border on the farcical. A formulaic filmmaker trying to appeal to the lowest common denominator might have used such scenes to mock Mehek and mental maladies. Not Kirpalani. These interludes serve to lull our senses before – boom! – another plot twist smacks us in the nerves. Mehek is popular, attractive and knows her mind. Watching her develop a phobia is akin to the shock you get when you discover that someone like Robin Williams suffered from severe depression. “How could a funny man be depressed?” here becomes “how could a feisty woman be afraid?” Medical professionals could explain whether the film is accurate in its depiction of agoraphobia, but this is for sure: by painting Mehek as a lively creature in that brief introduction, Kirpalani overturns the stereotypes about mental illness that so many of us harbour. Bravo! This is truly intelligent writing all around: the story is by Kirpalani himself, he co-wrote the screenplay with Arun Sukumar, and the naturally flowing dialogues are by Pooja Ladha Surti who is also responsible for the film’s crisp, clever editing. At the heart of it all is the wonderful Radhika Apte who is pitch perfect as Mehek. Apte has already built an impressive filmography in character roles across Indian film industries in the past decade. Her experience shows in Phobia in which she dominates the story and the camera rests on her almost throughout, without the strain showing for even a second. She is ably supported by believable performances from the entire supporting cast. Yashaswini Dayama playing her slightly kookie teenaged neighbour is a find. Though the film’s primary goal is to scare the bejeezus out of us, it is also filled with acute social insights. For instance, Mehek’s fear of the outside results from a sexual assault, yet in her flat she is stuck with the devil within. In that sense, Phobia is a metaphor for the omnipresence of sexual predators in a world where women are told to cover up, not step out late, not step out alone, not step into crowds, all to protect themselves, but judgmental misogynists have no answer for what is to be done about sexual marauders within homes, families, offices and among acquaintances. Mehek’s actions in her new home are an effort to help a woman she never knew. Her innate goodness, the risks a chirpy neighbour (Yashaswini Dayama) takes for her, the lengths to which Shaan goes for her indicate the film’s non-black-&-white view of the world. When we first see Mehek, it is evident she has a wide social circle. When it comes to the crunch though, the only one by her side is Shaan. Even her seemingly loving sister turns on her with alarming ferocity when she becomes an inconvenience. Then Mehek steps up for a stranger, then a stranger steps up for her. The crowd at the party does not turn up for Mehek, but decency is clearly not dead. Ghost flick, psychological thriller, social commentary or all the above – in the end, Phobia is what you want it to be for yourself. It is also, without question, a superbly entertaining film.